"I love that she follows her rules," makeup artist Tom Pecheux said of Doo-Ri Chung backstage at Doo.Ri during Fall 2010 Fashion Week. "She’s not a designer who looks at what’s next, what people are going to do." I loved hearing Tom talk about his love of collaboration with the designer, because this is one backstage I never, never miss. Tom's ability to continue to push the envelope when it comes to amazing lipcolors simply astounds me -- and this season was no different. "We’ve been doing lips the last few seasons, very bold colors always, "Tom told me. "Since she loves it, I love it, I think it works very well with the collection, we decided to carry on." And carry on he did -- with an amazing take on the classic red lip. Find out more after the jump. "Usually people go for rock or romantic or hippie," Tom said. "For [Doo-Ri], she’s kind of mixing everything with the girl of today. It’s not so 80's, so 90's, a full designer outfit is over. The girl today wants to be able to take a bit of everything. They want to be able to wear a tank top with a fur jacket and a pair of leather and a flower scarf or whatever." Tom took this inspiration into his look for the show, saying, "I love the mix of being a little bit gothic, a little bit romantic, a little bit glam rock. 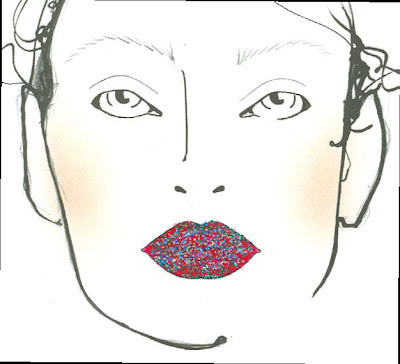 We decided since we're playing with glitter, the face should be very classic with a matte red lipstick." He began by applying Face and Body Foundation to the eyelids with his fingertips, then brushing Pro Set Powder in Invisible over the eyelids and brushing Iridescent Powder in Silver Dusk over the entire eye area with the 224 Brush. For the skin, Tom applied Face and Body Foundation with his fingertips for matte, light coverage. He followed with Pro Sculpting Powder in Shadowy, brushed below the cheekbones with the 116 Brush for subtle contouring. The face was finished with Pro Set Powder in Invisible, lightly applied to the entire face to set the foundation. The lips were the cornerstone of the look. "It's a very, very glamorous lip," Tom told me. He began by lining the edges of the lips with Lip Pencil in Cherry. He then applied Matte Lipstick in Ruby Woo, dabbing over the entire lip for full coverage. For the piece de resistance, Tom applied two different Pro Glitters -- Turquoise and 3D Silver. Tom gently wet the makeup brush and first applied Turquoise over the entire lips. He finished with 3D Silver applied just to the center of the lips. "Really big glitter -- we are not cheap at M.A.C!" he joked.